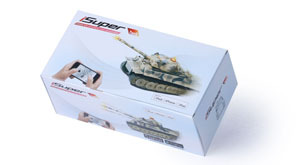 The iSuper Tank app turns your iPhone,iPod touch, or iPad into a great remote controller for an iSuper Tank, which will let you experience the thrill of driving a tank via your iPhone,iPod touch, iPad and Android devices! iSuper tank is amazing with its realistic detailing, great sound and motion effects,a full set of controls include track movement, turret rotation, cannon firing, especially the intuitive smartphone control that makes the battling more efficient, more fun! Playing with iSuper tanks is truly entertaining.The tanks attack each other by shooting infrared light beam, when one gets shot, it will groan, spin,after getting shot 4 times, it will be disabled, lose the battle; touching the wake-up button on the phone's screen, it will resume and continue working, totally like a real battle, once you start to play with it, you will become addicted to it. The tank can run and spin on any surface, roll over obstacles, climb at least 30 degree hills, the smartphone control is so interactive and easier, you just touch the app screen or tilt the device to have it complete any missions. Multiple iSuper tanks can battle with each other without interference, thus as long as you have a tank and a bluetooth touch screen phone, you don't need to wait for a turn, just immediately join the battle. iSuperTank app can let the smartphone or table records all the actions the tank performed, then later the tank will do a self-demo to repeat the recorded actions (like path running , spinning, shooting, streaming...). While taking a rest from the battling, you can play a game in the app, or play your favorite songs from the app. All in all, iSuper tank is a great ground unit for playing battling through smartphone or tablet control.